27 September 2018, New York.-The NCD Alliance and over 300 civil society organisations call on world leaders to go above and beyond the vague and unambitious commitments contained in the Political Declaration of the third UN High-Level Meeting on Noncommunicable Diseases (UN HLM on NCDs), adopted in New York on 27th September 2018. Governments cannot afford to continue sleepwalking into a sick future. The world is reaching an inflection point and a tepid response to NCDs is simply not an option – for the sake of billions of people around the world, it is time for a radical change. Global preventable death, disability, and suffering from NCDs continue to rise because of governments’ failure to act and invest for health. At the current rate of progress, more than half of all countries in the world will fail to meet the Sustainable Development Goal (SDG) 3.4 NCD to reduce the rate of premature deaths from NCDs by one third by 2030. Whilst we commend the Heads of State and Government embracing the opportunity the HLM presents to celebrate initiatives and progress, we contend that past actions will be insufficient to drive future change. Decisive new action is urgently needed to halt the tsunami effect of NCDs - on people, families, communities, and economies. The imperative for action has never been clearer. Over the coming decade, millions more people and communities will lose loved ones to avoidable and early death due to government inertia. Millions more will suffer pain, disability and anguish because of lack of diagnosis and treatment. Millions will struggle with entrenched poverty caused by catastrophic out of pocket health expenditures. These millions of people each have lives, stories and futures that could be much better. The world’s most marginalised populations are most at risk, exacerbating health inequalities and hindering social and economic development. The Heads of State and Government that attended the 2018 UN HLM on NCDs have the power to rise up as a united and formidable force against the scourge of NCDs. There is now palpable urgency and impatience for these political leaders to return home and follow up with action and investment, and to coordinate across the whole of government and whole of society, igniting the crucial collective response required to overcome the surging tide of NCDs. Governments have squandered the opportunity of this HLM to close the financing gap for NCDs with real commitments for the health of their people. Leaders who neglect to make significant investments in NCDs are failing their citizens and will be responsible for untold avoidable suffering and loss of life. Actions to save lives are simple and extremely cost-effective; investing in the tried-and-tested WHO Best Buy interventions yields a seven-fold return in low- and lower-middle-income countries. The absence of strong language on implementing the Best Buys, which focus on taxation, regulation and legislation, is a glaring omission from the document. This reflects interference and undue influence of health-harmful industries over a few countries who were prepared to shamelessly block progress for all. We are deeply disappointed that too few countries were prepared to stand up and show real leadership to put the health and wellbeing of their people ahead of the short-term and short-sighted economic interests of the few. Implementing the 16 Best Buys worldwide would save 9.6 million lives by 2025, according to new data by WHO. The enormous life-saving potential of these proven, cost-effective measures in the remaining years until our 2025 deadline includes, for example, nearly 70,000 lives in South Africa, 150,000 in Egypt, almost 250,000 in Italy, 340,000 in Germany, over half a million in the USA, 1.3 million in India and over 1.7 million in China. Failure to comprehensively implement these measures - and to try to block others - to save all these lives is inexcusable. The anaemic stance on accountability encapsulated within the document is perhaps its greatest failing. 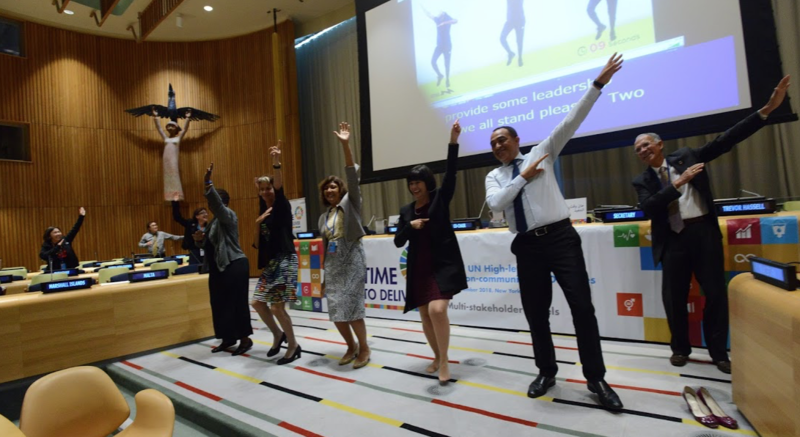 The scheduling of the next UN HLM on NCDs in seven years’ time risks prolonged procrastination, when today’s political leaders need to realign the trajectory of progress immediately to meet the targets that they have committed to for 2025 and 2030. We remind our leaders that their failure to date to deliver on their commitments at the 2011 and 2014 UN HLMs is not just statistics and economic losses, it is unnecessary suffering and preventable death in every country. We deplore the absence of new ambitious time-bound commitments and accountability measures in the Declaration to propel the response forward. Robust independent accountability mechanisms, including NCD Countdown 2030, will be essential to ensure that the promises made by the international community are delivered. Despite these disappointments in the Declaration, the display of leadership throughout the negotiations on the 2018 UN Political Declaration from several countries in Latin America, the Caribbean, and the Pacific Region was inspiring, with demonstrable commitment to their people and communities - exemplifying the mantra - ‘ENOUGH. Together we are stronger. Together we can beat NCDs.’ The inclusion of a paragraph in the 2018 UN Political Declaration on engaging civil society and people living with and at risk of NCDs in national NCD responses is a clear indication that governments have seen the value of working with civil society and the people most affected. Recognition of mental health and environmental risk factors for NCDs as core components of the NCD response reflects the reorientation towards a ‘5 x 5’ approach and is a definitive and crucial step towards more fully inclusive action for NCDs. Civil society was also pleased to see the negotiations on the Political Declaration successfully concluded with a compromise on the language concerning the Trade-Related Aspects of Intellectual Property Rights (TRIPS), which has important implications for essential medicines for treatment and care for millions of people living with NCDs worldwide. And, for the first time, an NCD Declaration includes language on respecting human rights obligations. This lays strong foundations for preparations towards the 2019 UN HLM on Universal Health Coverage - in which we expect to see NCD prevention and control fully integrated. The 2018 HLM on NCDs is a watershed moment for the NCD movement. We will not rest, we will not be polite in our own dedication and energy for a world free from preventable suffering and death from NCDs. We implore leaders: talk to your people and hear their stories, look at the data and commit to action for the sake of the people that the numbers represent, and ask yourselves: are you doing enough to ensure the health and well-being of your people, your societies, and your economies? We will hold leaders to account for their commitments, the organisations who obstruct progress, and those whose action or inaction are costing us all dearly. We have had enough of inaction on NCDs. We have had enough of apathy. It’s time to invest. It’s time to act. It’s time to deliver. It’s high time to save lives.